These ads are listed chronologically with the earliest ones first. From early in the 1900's Marlboro was marketed as a cigarette for the ladies. The cigarette brands that survived the end of World War II were the few that were distributed to the soldiers and Marlboro was not one of them. The brand was somewhat revived several years later still being marketed as a brand for the ladies. With the early 50's there began a suspicion that smoking cigarettes had something to do with lung cancer. Filters were generally decided to be the answer but Real Men, which was where the sales dollars were, didn't smoke a filter cigarette. The question then became how to make this cigarette appeal to men? The Leo Burnett advertising agency in Chicago was consulted and came up with campaigns that showed Real Men smoking Marlboro. First came the series with men with a tattoo on their smoking hand, tattoos were masculine then. Next came the long-running cowboy series, all in an attempt to convince the public that men could demand a filter too. The Marlboro Man became as famous as other Leo Burnett creations, the Pillsbury Dough Boy and the Jolly Green Giant. Black and white 4" x 5 1/4" ad for the cigarette that is considered to be as Mild as May. There is a picture of the lower part of the face of an attractive lady who is carefully withdrawing a Marlboro from the opened pack that she holds in her hands. The familiar caption tells us that "Ivory Tips Protect the Lips" and proudly boast that this is "A Cigarette created by Philip Morris". Black and white 4 1/4" x 5 3/4" ad for the cigarette that made the claim to be "Mild as May". There is a picture of a lady, from just above the lips down, holding a lit Marlboro in her fingers as she absently plays with the cigarettes in the pack that is perfectly positioned in the picture. The claim is also made in the ad, very important for the ladies which is who this cigarette was intended at this time, that the "Ivory Tips Protect the Lips". Black and white 4 1/4" x 6 1/2" ad that highlights the Ivory Tips on the ends of these cigarettes that are promised to "Protect the Lips". This ad is similar to others in that it has a picture of an attractive woman showing her from just below the nose to a high point on her chest. She is holding a lit Marlboro in one hand with the Ivory Tip circled so the readers will know just what is being referred to. The opened pack of cigarettes is shown as are her perfectly shaped lips that are being "protected" by her choice of cigarettes. The ad reminds us that the Ivory Tips help make this brand of cigarettes Mild as May. Black and white 4 1/4" x 6 1/4" ad that brings attention to their Ivory Tips which, we are assured, will "Protect the Lips". The ad has a picture of a woman, showing her from just below her nose to the upper part of her chest. She is holding up an opened pack of Marlboro cigarettes and has withdrawn one far enough so the Ivory Tip, or filter as we would now call it, is exposed and can be circled so that your attention can be drawn toward it. They describe the taste as "Mild as May" and remind us that this is "A Cigarette Created by Philip Morris". Black and white 4 1/4" x 6 1/2" ad for their cigarette that is as Mild as May. There is a picture of an attractive lady with bare shoulders and lips that are darkly glossed to accentuate their perfect shape. She is holding a lit Marlboro in her white-gloved hand and staring seductively at the camera as the text assures us that Marlboro's "Ivory Tips Protect the Lips". Black and white 4 1/4" x 6 1/4" ad for the Cigarette that was refered to as being Mild as May. There is a picture of an attractive lady leaning her chin on the hand holding a lit Marlboro as an opened pack of these cigarettes is visible next to her hand. The ad also assures you that "Ivory Tips Protect the Lips" and remind us that this is another product of Philip Morris. Black and white 4 1/4" x 6 1/2" ad for the cigarettes that are claimed to be as Mild as May. We see a nearly full face picture of a woman staring intently at the reader as she holds a lit Marlboro between her fingers. The woman has a dark hat on her head and seems to have some sort of fur wrapped up and around her neck while her lips, which are protected by Marlboro's Ivory Tips are darkly and precisely embossed with lipstick. The trail of smoke coming from the cigarette seems to be drawn in because it is a very concentrated plume rising nearly vertically. Black and white 4 1/4" x 6 1/2" ad with a picture of a lady with blonde hair staring wistfully upwards as she enjoys the Marlboro Cigarette that she holds between two fingers. Her lips are perfectly formed and darkly colored with lipstick and the text promises that their Ivory Tips protect the lips. It also claims the taste is Mild as May and that this is "A Cigarette created by Philip Morris". Black and white 4 1/4" x 6" ad that is a little bit different yet still calls attention to the Ivory Tips protect the lips. This ad has a profile shot of a woman and a man, both holding lit Marlboro cigarettes in front of their perfectly formed lips as they stare off into the distance. This is one of the first ads that I have seen that indicated that it would be acceptable for a man to smoke a filtered cigarette. The ad still indicates that Marlboro is Mild as May and that they are a peoduct of Philip Morris. Three color 4 3/4" x 12" ad for what was then considered to be "America's Luxury Cigarette". The headline, done in a high-end font, says that "Most of life's luxuries come high...buy anyone can afford Marlboro" and there is a picture of an opened pack of these cigarettes with a totally different look than what we would see just a few years later. The text claimsd they were "Merely a Penny or Two More" and showed they were available in Plain Ends, Ivory Tips or Beauty Tips (red). Three color 4 3/4" x 12 1/4" ad for their Better Cigarette. There is a drawing of their unique pack with the top torn open so that all of the cigarettes can be seen and their logo against the background. The headline claims that "Others may boast larger cars, costlier homes...but nobody can smoke a hetter cigarette!" and the small print mentions the three types available, Plain Ends, Ivory Tips and Beauty Tips. Three color 4 3/4" x 12" ad for the calming effect that smoking a Marlboro has. It also indicates that, at one time, someone thought that using a Baby was a great way to sell cigarettes. The ad has a picture of a serious, somber child with a party hat on and the headline has him saying "Before you scold me, Mom...maybe you'd better light up a Marlboro". Nest to a picture of a pack of Marlboros that someone has ripped the whole top open are the words "Yes, you need never feel over-smoked...that's the Miracle of Marlboro". Three color 4 3/4" x 13" ad that indicates that even the youngsters know that Marlboro is best. There is a picture of a little baby sitting there with a look of awe on it's face and the caption has him saying (thinking) "Gee, Dad, you always get the best of everything...even Marlboro". In the ad we see one of their unique packs that someone was so anxious to smoke one that they ripped the top open. The ad offers your choice of Ivory Tips, Plain Ends and Beauty Tips (red). Three color 4 1/2" x 10" ad for cigarettes that is very unusual. On a pink background is a photo of a baby, leaning forward and looking like he is trying to talk. The words that are coming from his mouth are "Gee, Mommy. You sure enjoy your Marlboro." Black and white 10" x 14" ad that tells you that "You get a lot to like - Filter - Flavor - Flip-Top Box" when you light up a Marlboro. The ad has a serious-looking man who is glancing off to his left at something as he sits there with a hat tipped back and a plaid shirt on. He is leaning on a trowel as a Marlboro sits burning in his lips. At the bottom of the ad is a drawing of their "New Flip-Top Box" and the claim is made that it is "Firm to keep cigarettes from crushing. No tobacco in your pocket". The ad text says that "You get the man-size flavor of honest tobacco without huffing or puffing. This filter works very good and draws easy". Black and white 10" x 14" ad with a picture of a man, standing there very gruffly and looking at something over to the left. holding a putter with a cap on his head and a Marlboro lit between his lips. His right hand is curled around the putter and he has the same tattoo that everyone in the ads of this time period did. The ad calls these "Marlboro the filter cigarette in the flip-top box". The ad also says that "You get a lot to like - filter - flavor - flip-top box" as well as "You get the man-size flavor of honest tobacco without huffing and puffing". They claim that the "Flip-Top Box keeps every cigarette in good shape" and that "You'd expect it to cost more, but it doesn't". Black and white 10" x 14" ad for their Filter Cigarette in the Flip-Top Box. There is a picture of a grim-faced man staring off into the distance as he holds his lit Marlboro in the hand that bears the tattoo. The headline claims that "You get a lot to like - filter - flavor - flip-top box" and that the "easy-drawing filter feels right in your mouth". Black and white 10" x 14" ad from the Tattooed Hand series for their Long Size Filter Cigarette. There is a picture of a stern-looking man pouring a hot liquid from his thermos into a cup being held in the hand with a tattoo of an eagle on the back while he holds a lit Marlboro between his lips and looks close to the camera. The headline says "Marlboro You get a lot to like - filter - flavor - flip-top box". The text begins by saying "Here's old-fashioned flavor in the new way to smoke" and the ad shows a picture of their New Flip-Top Box. At the bottom of the ad is the information that it is "Made in Richmond, Virginia, from a new Marlboro recipe". Black and white 10" x 14" ad for their Filter Cigarette in the Flip-Top Box. There is a picture of a handsome man leaning against a tree and slowly exhaling the smoke from the lit Marlboro that he is holding in the hand that bears the tattoo that identifies the male smokers in these late '50s advertisements. The headline claims that "You get a lot to like - filter - flavor - flip-top box". The text talks about the old-fashioned flavor and the filter that "works fine but doesn't get in the way"
Black and white 10" x 14" ad for their Filter Cigarettes. This ad has a picture of a male hand holding a King-Size Soft Pack of Marlboro cigarettes to offer one to the public. The ad text mentions that these are "Also available in the famous Flip-Top Box" and claims that "The better the makin's the better the smoke". This ad is larger than my scanner bed so the outer edges of the ad will not be visible in the scanned view. Full color 9 1/2" x 13" ad for their Filter Cigarette. 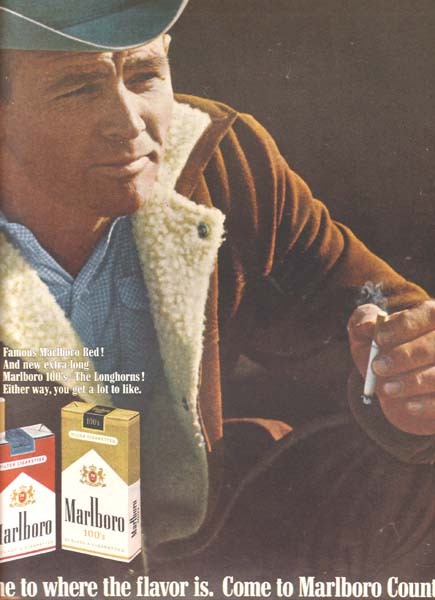 The ad has a picture of a hardy man standing with his jacket thrown over his shoulder and a cigarette between his lips. Visible on the hand that holds his jacket is a tattoo of an anchor on the back of his left hand. The ad headline claims that "You're smoking better when it's Marlboro". This ad is larger than my scanner bed so the outer edges of the ad will not be visible in the scanned view. Full color 9 1/2" x 13" ad for the cigarette with the Filter-Flavor Formula. The ad has a drawing of a cowboy with a marine tattoo on the back of his hand lifting a saddle up. If a guy that macho smokes Marlboro, you should too. The ad headline tells you that "The better the makin's, the better the smoke. You get better makin's in a Marlboro". This ad is larger than my scanner bed so the outer edges of the ad will not be visible in the scanned view. Black and white 9 1/2" x 14" ad for their Filter Cigarettes. There is a picture of a man still zipped up in his wet suit and wearing flippers slumped down in a folding chair and casually smoking a Marlboro. The headline challenges that "If you think flavor went out when filters came in - try Marlboro - the filter cigarette with the unfiltered taste". The text talks about their filter-flavor recipe which gives a man a lot of flavor to draw on and urges you to "Make yourself comfortable - have a Marlboro". Black and white 9 1/2" x 13" ad for their Filter Cigarettes. The ad has a photo of a man who is relaxing after a relaxing day of fishing. The photo shows him, still wearing his waders, lying with his head against his tackle box as he smokes a cigarette. The ad headline asks "Why don't you settle back and have a full-flavored smoke? try Marlboro - the filter cigarette with the unfiltered taste". This ad is larger than my scanner bed so the outer edges of the ad will not be visible in the scanned view. Black and white 9 1/2" x 13" ad with photos of football great Sam Huff, both in action and sitting and enjoying his cigarette. The ad headline encourages you to "Take a tip from Sam Huff - settle back and have a full-flavored smoke. Try Marlboro - the filter cigarette with the unfiltered taste". This ad is larger than my scanner bed so the outer edges of the ad will not be visible in the scanned view. Full color Two-Page (19" x 13") ad with a picture of a man, still in his bathrobe, sitting in his easy chair with his feet up. He has a cigarette in his left hand, an opened pack in his right and a carton with the gift tag from Santa on the table next to him. The ad headline says that "You give a lot to like with a Marlboro". Three color 9 1/2" x 13" ad for their Filter Cigarettes. The ad has a photo of football great Paul Hornung leaning against his locker with a lit Marlboro between his fingers. Paul has a thoughtful look on his face as he exhales the smoke from his cigarette. The ad headline asks "Why don't you settle back and have a full-flavored smoke? Marlboro the filter cigarette with the unfiltered taste". It then says "Paul Hornung: Green Bay halfback and 1961 National Football League Player of the Year. Paul's a Marlboro man all the way". Full color 9 1/2" x 12 1/2" ad for their Filter Cigarettes. This ad is like an earlier ad but this ad has a full color picture of Green Bay Packer running back Paul Hornung. Paul is leaning back against his locker smoking a Marlboro while dressed in a red shirt, black pants and a yellow jacket while the caption gives information about his football achievements. The ad headline asks "Why don't you settle back and have a full-flavored smoke? Marlboro the filter cigarette with the unfiltered taste". Black and white 10" x 13" ad for their Filter Cigarettes. The ad has a black and white picture of a man wearing the trappings of a cowboy lighting a cigarette at night with the lights of a major city in the background. The ad says this, and everywhere else, is "Marlboro Country" and talks about this cigarette having "the clean, brisk flavor of Marlboro's famous Richmond, VA recipe...". This ad is done in black and white but in the upper right hand corner of the ad are samples of the red and white soft pack and crush-proof box that Marlboro comes in. This ad is larger than my scanner bed so the outer edges of the ad will not be visible in the scanned view. Three color 9 1/2" x 13" ad for the Flavor you get from a Marlboro. The ad has a picture of a man man in cowboy gear leaning on a log fence and enjoying a Marlboro in spite of the fact that a horse is standing in front of him, staring him in the face. The ad headline assures us that "There's a world of flavor in Marlboro Country" and the ad text calls Marlboro the "filter smoke with the flavor reputation". This ad is larger than my scanner bed so the outer edges of the ad will not be visible in the scanned view. Three color 9 1/2" x 13 1/2" ad for the cigarette that's King in Marlboro Country. The bottom of the page has a black and white picture of a man riding his horse toward the camera on a dirt trail that has underbrush all around it. The ad text claims that with this cigarette "You get a lot to like: a man's world of flavor in a filter cigarette". At the top of the page is a full color picture of an opened pack of Marlboro cigarettes with several cigarettes pulled out. Black and white 9 1/2" x 14" ad for their exclusive Selectrate Filters. The ad has a picture of a man sitting astride his horse and lighting his Marlboro. There is a scenic and chilly scene in the background of snow-covered mountains and a lake with ice beginning to form. 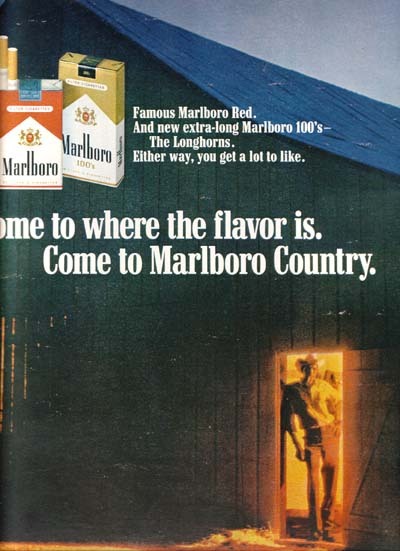 The headline tells you to "Come to where the flavor is...Come to Marlboro Country" and the text talks about the Selectrate filter and their Richmond Recipe. The rider may not be looking at the camera but the horse certainly is. This ad is larger than my scanner bed so the outer edges of the ad will not be visible in the scanned view. Full color 10" x 13 1/2" ad for their Filter Cigarettes. The ad has a picture of a cowboy who is squatting down in the middle of a corral to play with two of his dogs. This man has a lit Marlboro between his lips and the ad headline has the tip "Come to where the flavor is. Come to Marlboro Country". This ad is larger than my scanner bed so the outer edges of the ad will not be visible in the scanned view. Full color 9 1/2" x 13 1/2: ad for their Filter Cigarettes. The ad has a drawing of a cowboy adjusting his saddle as he smokes his Marlboro and looks to his right. The headline urges you to "Come to where the flavor is. Come to Marlboro Country". Full color 9 1/2" x 13" ad for Marlboro Filter Cigarettes. The ad has a picture, taken from behind, of a man in a sheepskin vest and a cowboy hat sitting with a group of men while he smokes a Marlboro and holds a cup of coffee in his hand. The ad headline encourages you to "Come to where the flavor is. Come to Mrlboro Country". This ad is larger than my scanner bed so the outer edges of the ad will not be visible in the scanned view. Full color 10" x 13 1/2" ad that has a picture of two cowboys, smoking their Marlboro's, as they stand in front of a herd of anxious horses. The two men are looking at something that is out of the camera's sight, something that makes one wonder. The headline says that we should "Come to where the flavor is. Come to Marlboro Country". Full color 9 1/2" x 13 1/2" ad for their Red Filter Cigarettes. There is a drawing of a rugged cowboy standing up with his thumbs in his front pockets, lit Marlboro between his lips and seeming to be looking over the reader's head. The normal headline asks you to "Come to where the flavor is. Come to Marlboro Country." Full color 10" x 14" ad that is another in the ones that showed that only, mostly, out-of-doorsmen liked Marlboro. This one shows a swift-moving creek that is going around a curve and one man is sitting on his horse and holding the second man's reins to his horse. The second man seems to be sitting, possibly fishing, on the edge of the creek. This ad shows the familiar Red box of Marlboro's right next to the Green box. The Green box indicated that the cigarettes were Menthol. The ad says that this is a "fresh new way of saying you get a lot to like in Marlboro Country". Full color 10" x 13" ad shows the sun setting on the range as several cowboys sit astride their standing horses and light their Marlboro cigarettes. The promise is made that "You get a lot to like with a Marlboro - filter, flavor, pack or box. Full color 9 1/2" x 13 1/2" ad for their New Marlboro Menthol Green. The had has a picture of a cowboy riding his horse across a picturesque meadow while holding the reins of another horse that is also saddled. The ad tells that "Now there's a new flavor partner to famous Marlboro Red". This ad is larger than my scanner bed so the outer edges of the ad will not be visible in the scanned view. Full color 9 1/2" x 13" ad for their Filter Cigarettes. This ad has a picture of a large man wearing western clothes and a serious look on his face while clasping his hands in front of him, smoking a Marlboro and leaning back against the sides of a fence. The ad tells you to "Come to where the flavor is. Come to Marlboro Country" and assures you that "You get a lot to like with a Marlboro - filter, flavor, pack or box"..
Full color 10" x 13 1/2" ad that asks us to "Come to where the flavor is. Come to Marlboro Country". 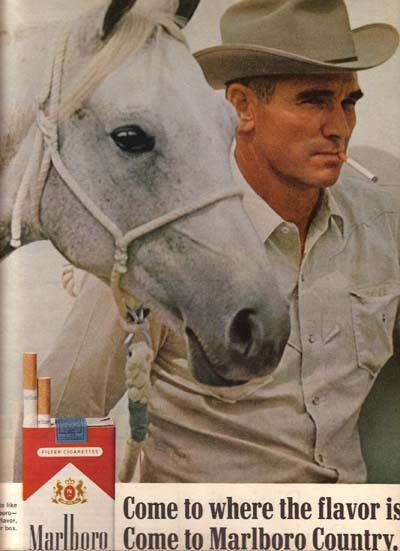 The picture in the ad shows a close-up of a man wearing a red shirt, a cowboy hat and having a just-lit Marlboro in his lips and standing next to the head of a brown and white horse. The ad says that "You get a lot to like with a Marlboro - filter, flavor, pack or box". Full color 9 1/2" x 13" ad that announces the arrival of Marlboro Menthol Green. The ad has a picture of a man riding a horse toward the camera. Behind him, filling the entire backdrop, is a wall of vivid, green trees. The ad headline says "New Marlboro Menthol Green" and calls it a partner to famous Marlboro Red. This ad is larger than my scanner bed so the outer edges of the ad will not be visible in the scanned view. Full color 9 1/2" x 13 1/2" ad for their Filter Cigarettes. 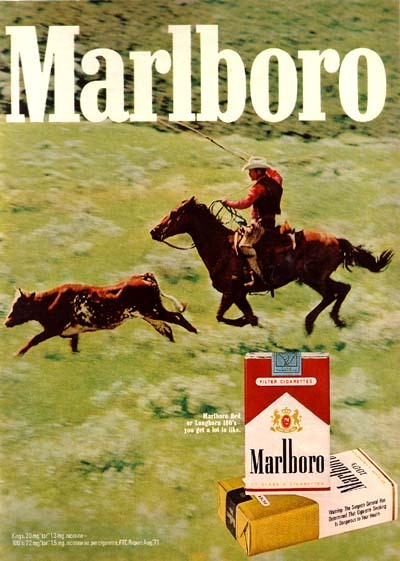 There is a drawing of a long, lean cowboy standing in the field with a small group of horses grazing behind him pausing in his daily activities to light up and emjoy a Marlboro. The headline asks you to "Come to where the flavor is. Come to Marlboro Country" and the caption by the picture of the opened pack says "You get a lot to like with a Marlboro - filter, flavor, pack or box". Full color 10" x 13 1/2" ad that shows some action that is taking place inside of a barn. Two cowboys are sitting there, both wearing hats, as one lights a Marlboro cigarette for the other. Just outside of this barn stands another cowboy with a horse, probably waiting for one of them to light a Marlboro for the other. This ad also has the saying that we should "Come to where the flavor is. Come to Marlboro Country". Full color 10" x 13" ad shows a man in a western style hat smoking a cigarette while he stands in front of a set of Longhorns that are attached to the wall. The ad headline says that "The Longhorns come to Marlboro Country". This ad is larger than my scanner bed so the outer edges of the ad will not be visible in the scanned view. Full color 9 1/2" x 13" ad for their New Marlboro 100's. The ad has a picture of a cowboy holding a cigarette to his lips while the silhouette of a longhorn can be seen in the background. 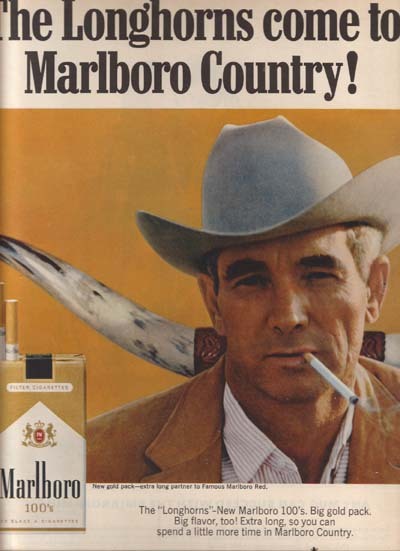 The ad headline announces that "The Longhorns come to Marlboro Country". This ad is larger than my scanner bed so the outer edges of the ad will not be visible in the scanned view. Full color 10" x 13" ad shows a man in a light colored cowboy hat and wearing a white shirt holding on to a white horse with a white rope. He is smoking a cigarette as the ad headline says to "Come to where the flavor is. Come to Marlboro Country". This ad is larger than my scanner bed so the outer edges of the ad will not be visible in the scanned view. Full color 10" x 14" ad that shows a tired cowboy sitting on the top rail of a corral as evening approaches wearing his coat, cowboy hat and smoking a just-lit Marlboro cigarette. The ad headline says that you should "Come to where the flavor is. Come to Marlboro Country" as there is a pack of the Marlboro cigarettes in the lower right-hand corner of this ad. We are told that "You get a lot to like with a Marlboro - filter, flavor, pack or box". Full color 9 1/2" x 13" ad for their Red and Extra-Long 100's. The ad has a picture of a weathered cowboy leaning on a saddle tossed over a stand in a barn. He is pausing in his hard day to enjoy his Marlboro. The ad headline calls you to "Come to where the flavor is. Come to Marlboro Country". This ad is larger than my scanner bed so the outer edges of the ad will not be visible in the scanned view. Full color 9 1/2" x 13" ad shows a man standing in the doorway of a barn as evening falls. The ad headline says to "Come to where the flavor is. Come to Marlboro Country". It also says "Famous Marlboro Red, And new extra-long Marlboro 100's - The Longhorns. Either way, you get a lot to like." Full color 9 1/2" x 13 1/2" ad for their Marlboro Red and Marlboro 100 cigarettes. The picture shows two cowboys standing in front of a wall of vertical logs holding the reins of a horse and one holds a lighter to the cigarette that the other one has in his mouth. The text mentions the two different types and promises that "Either way, you get a lot to like." Full color 10" x 13" ad shows a cowboy-style man resting and enjoying his Marlboro. This ad is larger than my scanner bed so the outer edges of the ad will not be visible in the scanned view. Full color 10" x 13 1/2" ad that shows a cowboy, I can tell because he is wearing a hat, smoking a Marlboro cigarette as he walks across the stable ground with a rope in his hand leading a horse to where he wants to take him. There is another horse watching as the headline wants us to "Come to where the flavor is. Come to Marlboro Country". At the bottom right-hand corner of this ad are the words "Marlboro Red or Longhorn 100's - you get a lot to like.." above a picture of one of each of these packs. Full color 9 1/2" x 13 1/2" ad has a close-up photo of the face of a weather-beaten cowboy who is relaxing with a Marlboro. The ad headline asks you to "Come to where the flavor is. Come to Marlboro Country". This ad is larger than my scanner bed so the outer edges of the ad will not be visible in the scanned view. Full color 7 3/4" x 10 3/4" ad for their Filter Cigarettes, This ad, a smaller version of another one on this page, shows a close-up photo of a man with a white hat holding a Marlboro between the thumb and two fingers of his left hand as the headline urges you to "Come to where the flavor is. Come to Marlboro Country". Full color 10" x 13 1/2" ad that shows a cowboy rinsing or filling a metal pot in a fast-running river. This man is wearing a white cowboy hat and a pair of cowbow boots with spurs as he kneels on some of the boulders on the bank and smokes the everpresent Marlboro cigarette in his mouth. The headline wants us to "Come to where the flavor is. Come to Marlboro Country" and, in the bottom left corner of the ad we can see a pack of the regular Marlboro's, red pack, and a pack of the Marlboro 100's, gold-covered pack. Full color 9 1/2" x 13" ad for their Filter Cigarettes. This ad has a drawing of a cowboy, done in shades of brown, leaning against a white backdrop with his thumbs hooked into his front pockets and smoking a Marlboro which seems to be as much a part of his face as his lips are. The headline on the page has the simple invitation "Come to where the flavor is. Come to Marlboro Country" and the caption under the opened pack in the lower right hand corner of the ad claims that "You get a lot to like with a Marlboro Filter. Flavor, Pack or Box". Full color 7 3/4" x 10 3/4" ad for the cigarettes loved by Real Men. The picture is a close-up of the face of a man taking a drag on his Marlboro. He has a white hat pulled low over his eyes but his weatherbeaten face is clearly able to be seen. The headline tells you to "Come to where the flavor is. Come to Marlboro Country" and the ad shows a pack each of their Marlboro Red and Longhorn 100's, both giving you a lot to like. Full color 7 3/4" x 10 3/4" ad for their Marlboro Red and Marlboro 100's. We see a cowboy standing in front of a black background using his lighter to light his Marlboro while he has a bridle over the arm that is holding the lighter. The headline has the familiar invitation to "Come to where the flavor is. Come to Marlboro Country." Full color 9 1/2" x 13" ad for their two popular cigarettes, Marlboro Red and the Longhorn 100's. The ad has a camera shot of a cowboy, hidden from his shoulders down, by the horses and saddles that occupy the foreground. He is looking alertly at something off to his left but the lit Marlboro never leaves his lips. The headline urges you to Come to where the flavor is" and the ad says that with either Marlboro you choose, "You get a lot to like". Full color 9 1/2" x 13" ad for their Cigarettes and for the Marlboro Beach Outfit you can get. The ad has a picture of the Cannon Beach Towel, with Marlboro written in large letters, and the Beach Bag / Inflatable Pillow spread out on the beach while a couple is in the background walking in from the ocean. The ad contains a coupon that you can fill out and send in with $2.50 and two end panels from a pack or box of Marlboro to get one of these gifts. This ad is larger than my scanner bed so the outer edges of the ad will not be visible in the scanned view. Full color 9 1/2" x 13" ad for their Red or Longhorn 100 cigarettes. There is a picture of a cowboy leading his horse across some well-trampled dirt as the headline says "Come to where the flavor is. Come to Marlboro Country." The ad says that, with either style you choose, "you get a lot to like." Full color 9 1/2" x 12 1/2" ad shows a cowboy with a white hat standing against a rough sawn wall and enjoying his Marlboro. The ad headline asks you to "Come to where the flavor is. Come to Marlboro Country". This ad is larger than my scanner bed so the outer edges of the ad will not be visible in the scanned view. Full color 9 1/2" x 12 1/2" ad has a photo of a cowboy wearing a white hat and chaps who is smoking a Marlboro as he carries a saddle over his shoulder. The ad headline says "Come to where the flavor is. Come to Marlboro Country". Shown in the ad are a pack of Marlboro Red and a pack of Longhorn 100's. Full color 9 1/2" x 12 1/2" ad shows a cowboy slowly riding his horse across a rocky coastline with the surf breaking all around him. He is fearless and has his horse under control as he smokes a cigarette which, according to the headline, must be a Marlboro. 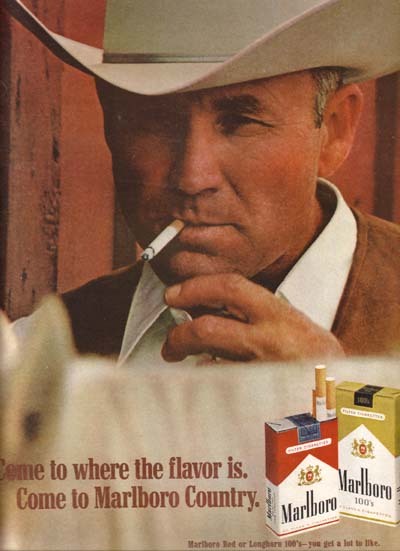 Full color 10" x 12 1/2" ad with a close-up photo of a cowboy in a white hat and vest smoking a Marlboro and staring off at something to his left. 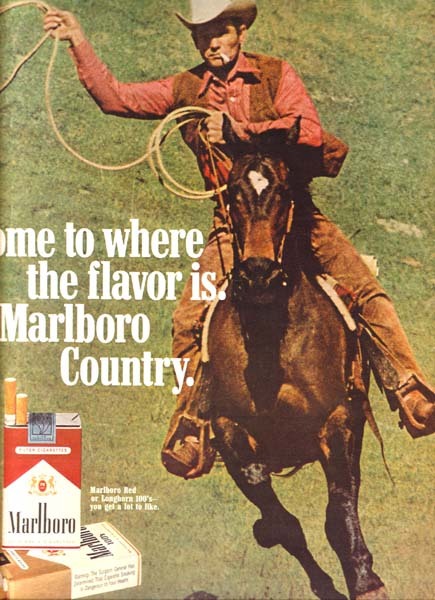 The ad headline says to "Come to where the flavor is" and the boxes indicate that Marlboro is that location..
Full color 10" x 12 1/2" ad shows a cowboy riding his horse, smoking a cigarette and preparing to lasso something off screen. The ad headline encourages the reader to "Come to where the flavor is. Marlboro Country". This ad is larger than my scanner bed so the outer edges of the ad will not be visible in the scanned view. Full color 9 1/2" x 13" ad has a photo of a weathered cowboy wearing a white hat and smoking a cigarette as he leans against a tree trunk that is more weathered than he is. The ad headline is the simple reminder to "Come to where the flavor is." This ad is larger than my scanner bed so the outer edges of the ad will not be visible in the scanned view. Full color 10" x 13" ad shows a cowboy lighting a cigarette while leaning against a weathered wood wall that has a saddle thrown over the top. The ad headline tells you to "Come to where the flavor is. Come to Marlboro Country". This ad is larger than my scanner bed so the outer edges of the ad will not be visible in the scanned view. Full color 9 1/2" x 13" ad for their Marlboro Reds and Longhorn 100's. The ad has a cold photo of a mountain scene where two cowboys are riding their horses across a snowcovered field under a clear sky. They may be cold but they are smoking their Marlboro's. The ad headline is the familiar "Come to where the flavor is. Marlboro Country". Full color 9 1/2" x 13" ad for their Filter and 100s Cigarettes. The ad has a picture of a ranch hand wearing snow shoes standing in the middle of a snow covered field by a barb wire fence that is in need of repair. He has tools to repair the fence in his right hand and he is staring off into the distance to his left as he takes a draw from the Marlboro that he holds between his lips. The ad headline invites you to "Come to where the flavor is. Marlboro Country". This ad is larger than my scanner bed so the outer edges of the ad will not be visible in the scanned view. Three color 7 1/2" x 10 1/2" ad for their Light cigarettes. There is a picture of an opened pack lying on its side with a full pack standing on it with the big, block headline saying simply Marlboro Lights. They are introduced as being "From Marlboro to America's low tar cigarette smokers - a new cigarette that's lighter in taste, low in tar." They may be Light but they are "made with the same famous quality as full-flavored Marlboro Red, America's fastest-growing brand." Full color 7 1/2" x 10 3/4" ad has a photo of a cowboy with a cigarette in his mouth holding tight onto a rope that is attached to something behind him. The ad headline states "Come to where the flavor is. Come to Marlboro Country". Full color 9 1/2" x 12 1/2" ad for their Marlboro Red and Longhorn 100 cigarettes. There is the normal western-themed picture of a cowboy sitting on his horse and guiding a small herd of cattle in the direction he has chosen. 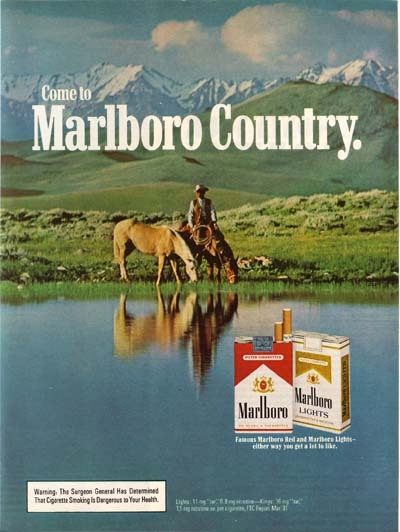 The typical "Come to Marlboro Country" headline graces the ad along with the promise that "You get a lot to like." Full color 7 3/4" x 10 3/4" ad shows a cowboy riding after a loose steer and preparing to rope him. The ad has the simple headline "Marlboro". Full color 7 3/4" x 11" ad that shows two cowboys riding towards us while the herd of cattle that they are leaving seem not to notice. The cattle, about a hundred of them, are grazing contently in what looks like the only grass in miles. The words in the ad simply say "Come to Marlboro Country and they are emblazoned in white next to colorful samples, one upright and the other lying on it's side, of their two kinds of products. Full color 9 1/2" x 13" ad for Marlboro Lights which have "The spirit of Marlboro in a low tar cigarette." There is a drawing of a cowboy riding his horse with a coiled rope in his hand chasing a loose horse while other horses are coming up behind him. In front of this scene is a pack of these cigarettes opened and with two individual cigarettes pulled up. Full color 9 1/2" x 13" ad for their Red and Longhorn 100 cigarettes. There is a picture taken from partway up a small hill that overlooks a field where one cowboy is watching a herd of horses. Just below the camera, comfortable in the shade, sit two cowboys by a campfire and both lighting up their Marlboro's. The headline, placed in the beauty of the countryside, says "Come to where the flavor is. Marlboro Country"
Full color 7 3/4" x 11" ad for their Red and 100's Cigarettes. There is a picture of a man wearing a fleece-lined coat and a cowboy had trying to light his Marlboro on a windy and cold day. He has cupped his gloved hands around the flame that seems to be, as a result, burning straight up. Full color 15" x 12" Two-Page ad for their Red and Longhorn 100's. The ad has a picture as big as all outdoors of a cowboy in a yellow slicker starting a ride up a long green covered hill. The ad headline is the familiar "Come to where the flavor is. Come to Marlboro Country". Full color two-page 15 3/4" wide x 11" tall ad for their Marlboro Red and Longhorn 100 cigarettes. The ad has a photo of two cowboys who have been driving an old wagon pulled by two horses that have stopped to check things over and smoke a Marlboro. The ad headline tells you to "Come to where the flavor is. Marlboro Country". Full color 7 3/4" x 11" ad that shows a group of cowboys fording a river with their wagon and several spare horses. The ad headline encourages you to "Come to where the flavor is. Come to Marlboro Country". Full color 7 1/2" x 11" ad for a Marlboro Belt and Buckle that was being offered at this time. The image that is pressed into the buckle is the background of the ad and the actual belt and buckle is shown too. The offer is that $7.00 and two end tabs from Marlboro cigarette packs will get one of these coming your way. The text talks about the quality of these buckles, the fact that they are numbered and on a top-grade steerhide belt. Full color 7 1/2" x 10 1/2" ad for a gift you could receive by sending in 2 end labels from a Marlboro product and $7.00. This ad offers a Steerhide belt and special edition buckle done by Bob Seriver. The ad has a picture of the belt and buckle and a close-up of the detail on the buckle. Full color 7 1/2" x 10 1/2" ad has a photo of a cowboy slowly riding his horse along the edge of a vegetation covered creek. The ad headline asks you to "Come to where the flavor is. Marlboro Country"
Full color Two-Page 15 3/4" wide x 11" tall ad for Marlboro Red and Longhorn 100 cigarettes. The ad has a photo of one cowboy driving a small herd of horses across a shallow creek. 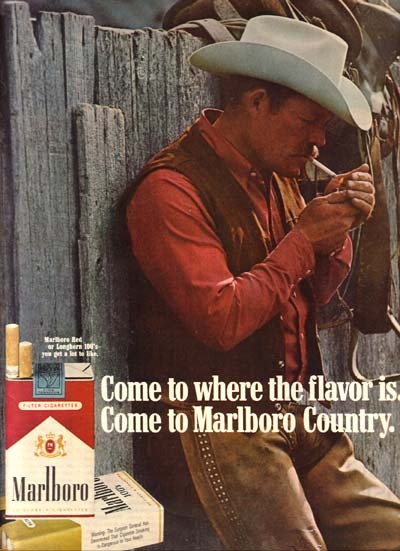 The ad has the familiar "Come to Marlboro Country" headline. Full color 7 1/2" x 10 1/2" ad for their Cigarettes and for a Riggin' Bag that is being offered for sale. The ad has a picture of a very sturdy looking leather bag that is shown lying on the ground with a picture of several cowboys behind it. The ad offeres this item for $90.00 and two end labels from any pack or box of Marlboro. Full color 7 1/2" x 10 1/2" ad has a photo of several cowboys rounding up a group of wild horses in a field as the sky looks like a storm is coming. The ad headline says 'Marlboro Lights - The spirit of Marlboro in a low tar cigarette". Full color 9" x 12" ad for Marlboro Lights. The ad has a photo of a cowboy riding toward the camera over some gentle rolling hills. The ad says "The spirit of Marlboro in a low tar cigarette." This ad is larger than my scanner bed so the outer edges of the ad will not be visible in the scanned view. Full color 8" x 10 3/4" ad that offers a Hudson's Bay Coat for $185.00 plus two end labels from a Marlboro product. The majorityof the ad has a photo of a cowboy wearing one of these coats riding through a snow covered forest and there is an inset photo of this coat along with the needed information. Full color 8" x 10 3/4" ad that shows a cowboy sitting on his horse while his horse and another one drink from a clear, still mountain lake. In the background are snow-covered mountains and gentle rolling hills of green. Full color two-page 15 1/2" x 10 1/2" ad for the real taste of Marlboro. The ad has a close-up picture of a cowboy sitting on his saddle with his hands looping his rope and the headline saying the familiar refrain "Come to where the flavor is. Marlboro Country". Full color 8" x 10 3/4" ad for Lights in the Regular Length or the 100's. There is a picture of a cowboy astride his horse twirling his lariat as he prepares to demonstrate his skill. The headline claims that Marlboro Lights have "The spirit of Marlboro in a low tar cigarette".